First off if you know me, then you know that I am passionate about B-movies and over the top Cheesy styles of cinema. I grew up with the all night Drive-In’s and Ghoul Hosted late night Television. I always have one answer when someone asks me what is your favorite B-movie, or guilty pleasure, and it’s easy for me, it’s Attack of the Killer Tomatoes. There is nothing close to this crazy film, but that is the beauty of it. 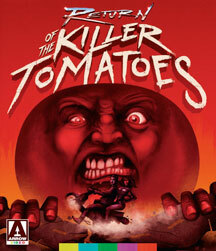 Now this Blu-ray I am reviewing is for the sequel of the Killer Tomatoes, better yet the Return of the Killer Tomatoes. As of this writing sadly no one has brought the first one out on Blu-ray and that’s a total shame. But I will settle with this brilliant Blu-ray being brought out by one of the greatest companies to exist in the DVD, Blu-ray world. Arrow Video is a one of a kind company that supplies brilliance to fans of Cult cinema, Low budget cinema, Drive-In late night fodder for the masses of those who love this style of entertainment. Return of the Killer Tomatoes is in my B-movie loving reality, a true Ace of guilty pleasure perfection. Arrow Video has brought out a stunning Blu-ray for this ultimate cheese fest of a film. IT has never looked any better. Vibrant and crisp in imagery. Sound is perfect. There is nothing better than a simple, silly, comedy and Return of the Killer Tomatoes is one of those ultimate experiences of late night fodder. The plot is set 10 years after the horrible rampage of Tomatoes in Attack of the Killer Tomatoes. Now the government has outlawed tomatoes, but there are those few who smuggle tomatoes. Your main characters Wilber Finletter, Chad Finletter, Matt Stevens. The Finletters run a Pizza place that makes pizzas without tomatoes. Add in the villain, the mad Professor Mortimer Ganggreen along with his assistant Igor, who plan to unleash another terror of killer tomatoes. Not just any tomatoes, but the professor can change tomatoes into human looking. His plan is to take over the United States of America with his diabolical plan. This is a perfect comedy horror that is totally ludicrous and that’s the beating heart of it. Directed by b-movie guru of cheesy cinema John De Bello. Bello has done all the Tomato movies, the B-movie masterpiece Attack of the killer Tomatoes. Plus, the one I am reviewing right now Return of the Killer Tomatoes. Also 1991’s Killer Tomatoes Strike Back, and 1992’s Killer Tomatoes Eat France. De Bello is a true B-movie god of silly over the top perfection. He has given the world some of the weirdest and yet perfectly B-worthy cinema that sticks with you. I am a huge fan of the whole series including the Killer Tomatoes Animated series that De Bello produced. Keep an eye out, because like Alfred Hitchcock, De Bello makes cameos in all of his Tomato movies. De Bello did it all, wrote it, had a part in it, directed it, produced it, he truly is a Killer Tomato. Arrow Video like always has done a lovely job in transferring this to 1080p Blu-ray. A fantastic new outlet to experience this wild film. I hope Arrow Video or some other company releases the others on top quality Blu-rays. Arrow Video shinned yet again in picking a truly unforgettable guilty pleasure film. This has never looked any better. An amazing quality. The 1080p presentation stands out above and beyond any other transfer of this film. Arrow Video did a fantastic job in giving a new outlet to this priceless Cult Favorite. Arrow Video aced this Blu-ray with total perfection in transfer, sound quality and most of all a product that is worthy to own and experience. I highly recommend this over the top B-movie, and this fine example of how to treat a film on a lovely high class Blu-ray by Arrow Video.